Since we left off with Eyes of the Master, it appears that matters have gone from bad to worse. The Master (Alex Macqueen) has recruited Dr. Sally Armstrong (Natalie Burt) from his 1970’s adventure with the Ides Institute as his very own companion. Worse, he’s playing both sides against the middle, attempting to manipulate and exploit both the Eminence’s Infinite Warrors…and the titular “dark eyes” Timelord weapon we know more personally as Molly O’Sullivan (Ruth Bradley). Written in its entirety by Matt Fitton (The Wrong Doctors, Afterlife, Signs and Wonders, Charlotte Pollard, Luna Romana, Survivors, Counter Measures Series 3, The Dark Planet, The Time Machine, Dark Eyes 2), this is a more unified if not unilateral season. While there are, technically speaking, the usual four discrete stories to be found herein, the reality of the situation is that this is actually one long story, and not in the sense of prior seasons bearing an overarching motif and grand design. Think of it as one long Peter Jackson film, perhaps sliced into saleable bits, but still actually one nigh-changeless story spanning the entirety of the set. In The Death of Hope, The Doctor is brought to the site of Aaron’s World by Timelord Celestial Intervention Agency agent Narvin (Sean Carlsen), to bring him up to speed on The Master’s recruitment of both Armstrong and O’Sullivan and his plan to utilize the latter to cure Infinite Warriors of the Breath of Life. That’s pretty much it; The Doctor watches events unfold, powerless to act throughout. “That’s what poor old Kaleshnikov thought too. You’re familiar with Mikhail’s work? Like you, he was a genius, a gifted engineer…he began working on tanks, even though he’d always said he’d rather be designing tractors. The fact is, he didn’t design tractors. “Deep down, you know…that you’re not special. As far as The Master’s concerned, you could be anyone…someone to fetch and carry, hold his test tubes and tell him how wonderful he is. But soon enough, he’ll grow tired of you…discard you, and forget about you. Because you and I both know who it is The Master really cares about. The most comparatively intimate of the stories contained herein, Masterplan slips in a few eye opening wake up calls to a general public all too inclined to both passively allow and indeed actively support institutionalized evildoers in the hope that they too can join what is in fact a tightly closed circle of would-be “elites”. Like a strong cup of coffee, this story comes like a breath of fresh air amidst all the battleground doings and backroom political machinations that surround it. All of the characters get to psychoanalyze and explore the deeper motivations of the others, with each side getting some fairly biting and apropos digs in on their opposite number. No one comes out unscathed, and what could be more honest and true to the human condition than that? 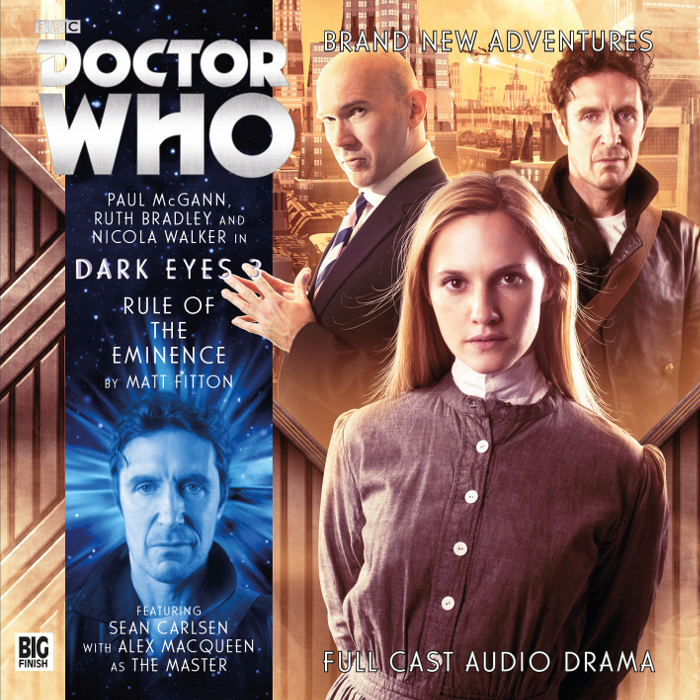 Admittedly, this is still a rather central battleground of the overall Timelords vs. Daleks vs. Eminence vs. Master war that the Dark Eyes series revolves around. And yes, The Eminence do show up for the final third to bring matters kicking and screaming back into the trenches. But for the better part of the story, Masterplan provides the one bit of business where characterization, rather than the insanity and casualty of militarism and warfare, are given the opportunity to come to the fore. Perhaps it’s still a bit dry. Certainly, its messages and metacognitive analyses of persona and motivation are quite bracing. But it’s quite a welcome breather from the battlefield nonetheless. Finally, Narvin takes The Doctor into the alternate timeline he created due to his intervention during the events of Masterplan in Rule of the Eminence. Beth Chalmers (Raine Creevey from the Sylvester McCoy Lost Stories, as well as roles in The Wrong Doctors, Spaceport Fear, Avengers Lost Episodes vol. 2 and Philip Hinchcliffe Presents’ The Devil’s Armada), Georgia Moffett (Frankenstein) and Jonathan Forbes (Daleks Among Us, Afterlife) all turn up for a spell in this bit of dystopianism where The Eminence (ostensibly under the aegis of The Master) nearly manage to conquer the entire planet…except for the intervention of The Doctor. 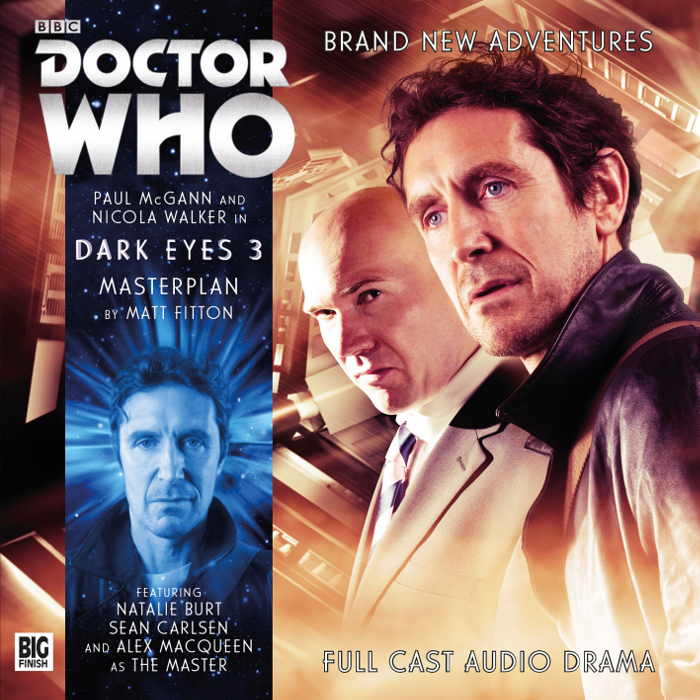 Paul McGann and Ruth Bradley are welcome as ever, and do their best with some overly busy, action-oriented material. But the fact is that they, and attention to characterization per se, get a bit lost in all this wartime business and intricately managed power politics. One story aside, there just isn’t enough room for them to expound on things to the level they truly deserve amidst plotting quite this dense and events operating on quite this grand a scale. While good acting will show through in even the most inhospitable of scenarios, the increasingly complicated, even deadlocked chess game of the Dark Eyes series is hardly the ideal setting for actors to emote and develop subtleties of persona and interaction. All this noise and nonsense, explosions and militarism…it’s just ugly, and not what life’s all about. Needless to say, while I do enjoy several of the actors and actresses involved here, this setting, this sort of CG-style fireworks and rollercoaster sturm und drang “big event” feel is just not my thing in any respect, so those who do enjoy that sort of Grant Morrison Justice League-esque “widescreen” storytelling should bear that in mind. Alex MacQueen continues to provide his Geoffrey Beevers by way of Michele Gomez iteration of The Master, partly preening, oily menace and partially barking mad. It certainly works, and even provides a laugh or two (as with the bit about the hat in The Death of Hope), but while I certainly appreciate the subtleties of his ever-shifting tonality of performance, I still prefer the more dashing, stable villainy of a Roger Delgado (or for that matter, the less obviously insane take of Beevers). Mind you, no question of accomplishment involved or implied here, rather more a matter of personal taste. That being duly noted, MacQueen’s take on the role certainly merits ranking among the top tier of Master incarnations, and deservedly so – longstanding preferences aside, he’s quite good. Nicola Walker’s Liv Chenka is far too bristly, cold and battle hardened to truly warm to in any real respect, with her chilly sendoff in Masterplan leaving a decidedly bitter taste in the listener’s mouth. Sure, she wasn’t actually responsible. But with that speech and viewpoint, is she not still culpable? 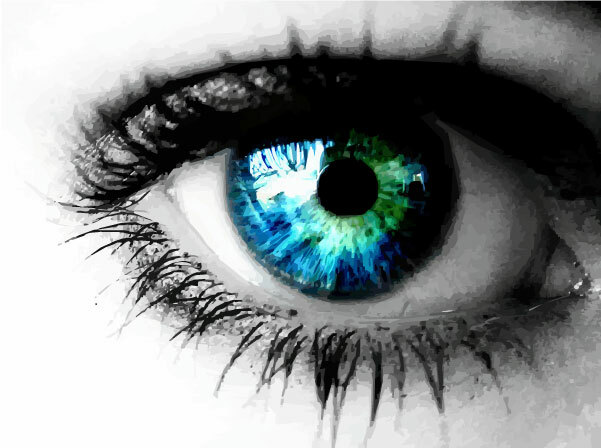 Chenka may in fact be the ideal companion for a series set within and revolving around the horrors of war. But that’s no compliment. Overall, I was glad to see far less of the Daleks this time around, but there’s still enough of The Eminence, The Remosans and several settings’ worth of beleaguered, militarized (or war-torn casualty afflicted) locals to set my nose a bit out of joint. While putting as much of a logical and human element into the equation as possible, it’s all far too Call of Duty meets Halo by way of Starship Troopers for my taste, and though the prospect of a more intimate Doctor vs. Master (and inferred companion vs. companion!) series left me a bit eager to experience this round, with the partial exception of Masterplan, the actual result is far likelier to appeal to fans of the aforementioned videogame franchises (and film) than those who share whatever measure of similarity in tastes to those of my own.